When you're choosing promotional clothing for your company, it's important to give these garments a lot of thought. Don't just slap your logo on the back or a t-shirt or the corner of a polo without taking time to consider the options. The clothing needs to be well suited to both the company and the purpose of the shirt. Here are some questions to ask yourself when you're designing promotional clothing to brand your company. Will this shirt be worn daily or occasionally? Company uniforms for daily wear need to be durable and easy to clean. Don't choose something high end that needs to be dry cleaned. What image do you want your company to present? If you want to appear edgy and trendy, a t-shirt with graffiti-style letting, bright colors, and modern artwork may work very well. When you want to present a more professional image, a simple logo and neutral-colored shirt may be better. What colors and designs are associated with your company? If your logo features black, yellow, and red, you should not order promotional clothing in purple and green. People won't recognize your shirts as belonging to the company and you'll only confuse the image that you've worked so hard to build. 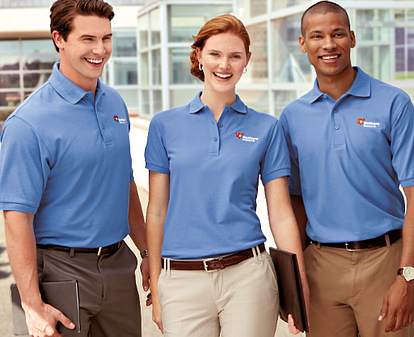 One great way to use promotional clothing is in the form of an employee uniform. Any company with a public store front should have matching uniforms for employees. If your store has a more eclectic feel, consider offering your employees two or three designs to choose from so the clothing is somewhat personalized, but still easily recognizable. Matching clothing is also important when your employees are on the road. Participating in a golf tournament, 5K, or other charity event is a great way to give back to the community. Make sure your team has matching t-shirts, polos, or other sports attire so they're recognizable.